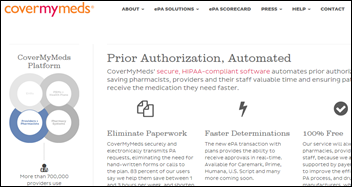 McKesson will acquire privately held prescription electronic prior authorization vendor CoverMyMeds for $1.1 billion plus another $300 million if the company hits performance targets. McKesson will operate the Columbus, OH-based company as an independent business unit. Francisco Partners must have made a fortune from its November 2014 investment in the company. I interviewed co-founder Matt Scantland a couple of years ago, where he explained that drug companies pay for CoverMyMed’s services to avoid unfilled prescriptions. He also agreed then with my assessment that the company was flying under the radar in an obscure niche with $19 million in revenue. That figure jumped to $50 million the same year and $100 million the next. McKesson also announces Q3 results: revenue up 4.7 percent, EPS $3.03 vs. $3.18, meeting earnings expectations but falling slightly short on revenue. Shares dropped 8.3 percent Thursday on the news. From Build That Well: “Re: Becker’s. Changed their story on Erlanger’s loss.” Becker’s focuses on clickbait “10 things to know” listicles written mostly by new liberal arts grads for lazy readers. In this case, they tried to hype Epic as causing Erlanger’s reported loss, but the article they rewrote from the local newspaper didn’t say that at all. Above is the headline before and after. The non-alternative fact, according to Erlanger’s CFO, is that the loss was caused by overtime expense, employee insurance payouts, and drug costs, although he did mention almost as an afterthought that some overtime expense was incurred due to covering employees assigned to the Epic project. Erlanger’s CEO says in another newspaper’s article he’s happy that the hospital is hitting its year-to-date net income targets given that it amortized its $100 million Epic cost over just three years. Erlanger also notes that high-deductible insurance plans and its 33 percent self-pay rate means it can’t collect a lot of what patients owe. From Clustered: “Re: Epic. I’m not bothered about their position on investment. How many times have there been things truly beautiful, streamlined, and elegant that were designed by committee? Investors are exactly that, collectively — a committee. They dilute decision-making in exchange for access to money and it sounds like Epic already has enough money of its own. Sure, there are things I wish Epic did differently, but I’m not sure inviting a bunch of MBAs and money folks onboard would improve things. Viva la Judy! (disclosure: I don’t work for or with Epic and never have).” Committees are like well-diversified mutual funds – they reduce the chance of both great failure and great success, at least if you’re willing to accept bland mediocrity. The best lessons I’ve learned in writing HIStalk are: (a) people can convey their strong opinion in believing that they represent the majority when in fact they could be dead wrong; and (b) instead of letting a committee tell me what to avoid doing wrong, I would rather just do what I want to do and let readers either come back or move on. From Silicon Valley Geek: “Re: Stanford Health Care. Since the new CEO arrived in July, the former CIO (who was promoted to chief digital officer last April) is leaving along with the associate CIO. 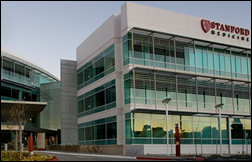 The bloated 700-employee IT department serving a 600-bed hospital and ambulatory network has been seeing layoffs as the organizational struggles to manage operational costs, new construction, and integration of the newly acquired ValleyCare. IT lost over 50 people yesterday as the CEO announced a $100 million savings target for which non-labor cutbacks weren’t enough. Michael Sauk is now interim CIO – he used to work with the CEO at City of Hope and UW.” Unverified, except the part about Mike Sauk since it’s on his LinkedIn. I’ve closed signups, so hopefully if you wanted to attend you either (a) got your name on the list in time, or (b) will be sent an invitation from one of the sponsors of the event, who get to invite a certain number of guests. I’m happy that our Industry Figure of the Year (one of the four nominees above) has confirmed attendance at the event, as has our “when ___ talks, people listen” recipient. I’m trying without success so far to get our “person you’d most like to see on stage” and Lifetime Achievement Award winners to stop by, but you never know. PatientSafe Solutions obsesses over the experience of care to help care teams communicate and work together reliably and efficiently. PatientSafe delivers measurable safety and quality improvements through a mobile platform that extends an organization’s EMR, clinical, and communication infrastructure and fits seamlessly into care team workflows. The company’s context-driven PatientTouch platform unifies communication with workflow by consolidating text, talk, alerts, EMR data, clinical workflows, and customizable care interventions, all in one mobile app, on one device. For more than a decade, PatientTouch has helped clinicians both in and outside the hospital streamline care delivery, increase quality, and lower costs. 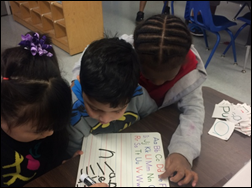 Ms. M in Houston sent photos of her students using the listening center and wipe boards we provided in funding her DonorsChoose grant request. Welcome to new HIStalk Platinum Sponsor Clearsense. The Jacksonville, FL-based data science company offers a cloud-based analytics solution that works with any data source and can be rolled out in a fraction of the time required for a traditional data warehouse. Its real-time, cloud-based, subscription-priced, scalable system helps healthcare organizations respond to the pressure to use data to make better and faster decisions. Examples: reducing adverse events, improving patient flow, hitting quality and patient satisfaction targets, driving research, and managing cost and payment. Thanks to Clearsense for supporting HIStalk. I found this excellent YouTube video featuring Clearsense Chief Innovation Officer Charles Boicey MS, RN speaking at the most recent HIMSS SoCal Clinical Informatics Summit. Readers have been asking for years to be able to search HIStalk articles with a company name and date range and I finally figured out how to do that in an admittedly inelegant but somewhat effective way. 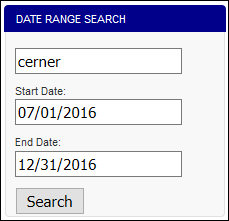 The date range search box allows specifying a search word (it works best with a single word) and an optional “from” and “to” date range, then shows the results in context. It’s not perfect, but it’s good if you want to see when I mentioned Cerner, let’s say, in just the second half of 2016. 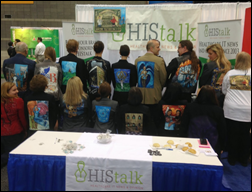 We like to have cool people hang out at our HIMSS booth since we don’t have anything to sell and are otherwise sitting alone in our microscopic, unadorned space. Contact Lorre if you would like to entertain, amuse, or otherwise engage HIStalk readers for an hour or so – we tend to like people who are funny and don’t take themselves too seriously, which is harder to find in health than you might expect. Does ICD-10 have a code for repetitive stress injury caused by anxiously checking three news sites every 10 minutes, drawn by a combination of fascination and dread? This week on HIStalk Practice: Northwest Vein & Aesthetic Center rolls out Oncomfort’s anxiety-reducing VR technology. Employee clinic company OurHealth signs on with Athenahealth. Pediatricians take aim at wearables for infants. Eye Care Leaders adds OptimizeRx to partner EHRs. Winners Circle series launches with MTBC winner and Practice Manager Baqar Naqvi. Stakeholders band together to encourage renewed value-based payment reform efforts. Compulink adds Weave’s patient scheduling tech. Sue Kressly, MD advocates for pediatric-specific functionality in EHRs. Sign up for physician practice health IT news. Listening: the now-defunct After Forever, since Floor Jansen is in my opinion the best singer (of either gender) in the world and the band was crazy talented, as are many of those in the “Beauty and the Beast” metal genre. Now she sings for NIghtwish, where she’s equally good although with less-demanding material. Floor singing “Leaden Legacy” with AF is about as good as it gets. Quality Systems (NextGen) reports Q3 results: revenue up 9 percent, adjusted EPS $0.23 vs. $0.16, beating analyst expectations for both. A brand’s logo is its face to the world. Our new orb-shaped visual identity represents the continuum of how we help our clients engage their patients before, during, and after visits. 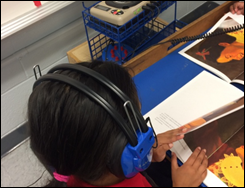 It signifies the perfect balance of improved efficiency with proven outcomes. And it symbolizes the unending dedication of our team to remain in motion as we continue to pioneer the HCIT solutions of the future. The fiery color of our logo was chosen specifically to depict the passion and commitment to client satisfaction of the people who make up the SRS Health team. 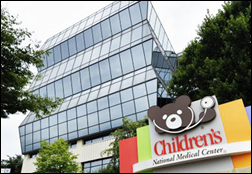 Children’s National Health System (DC) adds Millennium Revenue Cycle to its Cerner EHR. Local governments in Finland choose Optimum Healthcare IT to staff the 29-hospital Epic implementation of their $615 million Apotti project. Former HHS Secretary Sylvia Burwell is hired as president of American University in Washington, DC. I wondered about her advanced degree and it turns out she doesn’t have one. Investment banker Jefferies hires Dmitry Krasnik (Houlihan Lokey) to lead its coverage of healthcare IT. InterSystems and Clinical Architecture develop a “clinigraphic” graphical representation of a patient’s most pertinent information contained in medication lists, comorbidities, and test results. The Gates Foundation donates $279 million to University of Washington’s Institute for Health Metrics and Evaluation, which publishes evidence and trends for global population health that includes the annual Global Burden of Disease report. 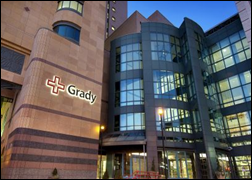 Grady Health System (GA) goes live on Glytec’s eGlycemic Management System of personalized insulin dosing, blood glucose alerts, and analytics integrated with Epic as well as glucose surveillance integrated with Grady’s laboratory information system. A small survey of PCPs published in NEJM finds that only 15 percent think the ACA should be repealed entirely, with three-quarters of them saying it just needs tweaked (some of their suggestions are above). The doctors mirror the general public in supporting existing policies such as prohibiting consideration of pre-existing conditions, allowing parents to keep their children on their insurance through age 26, offering taxpayer-funded small business tax credits and individual subsidies, and expanding Medicaid. Fewer than half support requiring people to carry insurance, however, thus again raising the all-important question of how insurance companies can create cost-effective risk pools among only self-selectors. Massachusetts Governor Charlie Baker – a former CEO of insurer Harvard Pilgrim Health Care — defends his call for employers to pay the state $2,000 for each employee who either isn’t offered health insurance or who declines to buy it. The state’s MassHealth program is spending $1 billion per year to subsidize health insurance for low-income, full-time employees who could buy employer-offered plans but instead sign up for MassHealth to take advantage of premium subsidies, which the state says is an ACA loophole. Baker is also calling for limiting provider rate increases, with price hikes of the most expensive hospitals capped at the same level as their Medicare increases. MassHealth’s annual cost of $16 billion accounts for 40 percent of the just-released 2018 state budget. President Trump says in a TV interview that his replacement for the “disaster” of the Affordable Care Act will offer “a better plan, much better healthcare, much better service treatment, a plan where you can have access to the doctor that you want and the plan that you want. We’re gonna have a much better healthcare plan at much less money.” He also says that he expects everyone insured through the exchange to keep insurance coverage. President Trump’s deportation executive order instructs federal agencies to exclude illegal aliens from the Privacy Act, which prohibits the the disclosure of a person’s federal government-held information without their consent. The Act covered only citizens anyway, from what I can tell, and I’m not sure this order has any direct impact on healthcare. Perhaps the significant result is that agencies would need to know (and therefore ask) about immigration status and systems might have to be modified to record it. 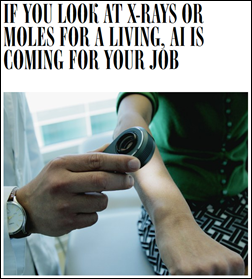 A Wired article notes that improvements in graphics and artificial intelligence technology may render obsolete those doctors who look at an image and then decide what it is, warning that pathologists, radiologists, and dermatologists are at risk of being replaced by machines. It cites the just-published study in which neural networks trained on previous images performed as well as 21 board-certified dermatologists in recognizing cancerous growths. The Wall Street Journal profiles McKesson Specialty Health’s Practice Insights analytics platform for oncology practices, which extracts EHR information for clinical insight and matches patients with clinical trials. A patient of a family practice owned by Carolinas HealthCare (NC) complains after noticing that her problem list included “lesbianism.” The health system said the observation was listed there to avoid offending her, but offered to move it to the notes section of her chart. The patient questions why the health system needs to record her sexual orientation at all. I’m not sure I agree since I assume she told them and thus felt they should know, but perhaps the term “problem list” casts an unintended aspersion. This could be a challenge for the OpenNotes movement – recording patient-reported or observed information in a way that patients don’t take as offensive, although this example is less of a challenge than accurately identifying someone as obese, alcoholic, or depressed. 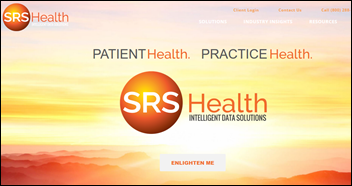 Sutherland Healthcare Solutions publishes a video describing its SmartHealthSolutions analytics platform. ECG Management Consultants will exhibit at the Summit on Bundled Payment January 25-26 in Atlanta. EClinicalWorks and Vocera will exhibit at Arab Health 2017 in Dubai. Imprivata and Obix Perinatal Data System will exhibit at the Arab Health Congress January 30-February 2 in Dubai. PDR will exhibit at the Inspire 2017 Rx30 User Conference & Expo January 27-28 in Orlando, FL. MedData will exhibit at the American Society for Anesthesiologists Practice Management event January 27-29 in Grapevine, TX. The Intrepid Healthcare podcast features Meditech AVP of Marketing Christine Parent. Mr. H – you’re too kind to Beckers to write off these “fake news” headlines to a well intended mishap with a new liberal arts major. This is a pattern and likely intentional on behalf of Beckers. They’re lucky Epic isn’t litigious. And, I think it would one day be cool to have a few insiders at Beckers leak the story behind these stories about Epic. Any insiders want to share the inside story behind these attacks? Totally agree, this just sounds like a crummy configuration of an exam template rather than malice on the part of the doctor. Its absolutely germane to a “whole patient’ approach to care, as it impacts conversations a doctor will and will not have with the patient (see Faker McFakepants observations about how the BC conversation goes). Home life has an impact on people’s health and any primary care doctor worth their salt will inquire even casually about how things are going at home. Even something as small as getting the honorific of a person’s partner — husband or wife — correct is useful when talking to a patient. Re: Lesbianism as a Problem. You said ‘I’m not sure I agree since I assume she told them and thus felt they should know’. This generally comes up in the discussion of birth control. This does not equal a medical problem. Let’s just be clear that Judy is turning the company over to a foundation, that will undeniably be run by…. (wait for it)…. (wait for it)…a committee. What a crisis of conscience we’re going to have once that happens. The foundation will be getting class B non-voting shares. The class A voting shares that Judy owns will be sold back to Epic. So yes, the foundation will get a bunch of stock but no control at all over the company. I would love it if you could apply the same standards to President Trump as you do for other sources. Namely, please don’t bother posting something he says unless he’s actually communicating information, not just because he’s the President and makes mention of healthcare. This quote is pointless. I appreciate that HISTalk rarely wastes my time with this type of vacuousness. Thanks. What’s the ICD-10 code for “Lesbianism”?